We’d love your help. 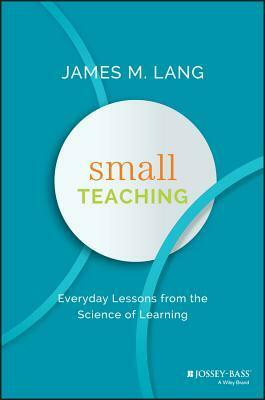 Let us know what’s wrong with this preview of Small Teaching by James M. Lang. Employ cognitive theory in the classroom every day Research into how we learn has opened the door for utilizing cognitive theory to facilitate better student learning. But that's easier said than done. Many books about cognitive theory introduce radical but impractical theories, failing to make the connection to the classroom. In "Small Teaching, " James Lang presents a st Employ cognitive theory in the classroom every day Research into how we learn has opened the door for utilizing cognitive theory to facilitate better student learning. But that's easier said than done. Many books about cognitive theory introduce radical but impractical theories, failing to make the connection to the classroom. In "Small Teaching, " James Lang presents a strategy for improving student learning with a series of modest but powerful changes that make a big difference-many of which can be put into practice in a single class period. These strategies are designed to bridge the chasm between primary research and the classroom environment in a way that can be implemented by any faculty in any discipline, and even integrated into pre-existing teaching techniques. Learn, for example: How does one become good at retrieving knowledge from memory? How does making predictions now help us learn in the future? How do instructors instill fixed or growth mindsets in their students? To ask other readers questions about Small Teaching, please sign up. James Lang is a frequent contributor to Chronicle of Higher Educationwhere I've always enjoyed his essays. I've read several books on teaching in the past year; Small Teaching: Everyday Lessons From the Science of Learning was one of the meatiest and thought-provoking, a nice palate cleanser as I prepare for the new semester. Small Teaching was similarly enjoyable: well-written, easily read and digested, filled with concrete advice on a range of topics. He tells personal stories to make his point, both from the classroom and the rest of his life. He is generous, sharing both his successes and his failures. Lang's thesis is that rather than attempt a radical redesign of your course, make small changes that can be successfully implemented even by tomorrow. He follows through with this promise by offering at least 40 small changes to engage and motivate students, and help them learn and understand more effectively. I have dog-eared my copy and scribbled my way through it, identifying many places where I was already following his suggestions, but also seeing a variety of tweaks that I plan to make in my courses next semester to make my teaching more effective. Most books on teaching offer one big idea, which is developed over the course of the book, with many opportunities to think about the ideas raised therein. The only "problem" I have with Small Teaching is that it offers an embarrassment of riches, many of which will get lost in the next weeks and months without being implemented. I returned to it with a group of colleagues, then again later in the year. Treasure trove of great teaching ideas. James Lang would beg to disagree. In Small Teaching: Everyday Lessons from the Science of Learning, he introduces strategies that we can implement tomorrow without too much planning and preparation. Here’s one: start class with a story. Whether it’s about a scientific discovery, a personal experience in a dysfunct Can’t get students’ attention at the beginning of class? Did they already forget what they learned two days ago? Two weeks ago? Feel like it’s too late to change anything at this point? I have read much by James Lang in the Chronicle of Higher Education and was interested to see that he had a volume out on teaching strategies for classroom professors based on current science of learning. Overall, this small volume on "Small Teaching" succeeds on many levels and would make an excellent jumpstart summer-read for teachers who feel that perhaps some of their courses and teaching have stagnated in recent years. Based on the strategy of "small ball" from baseball where rather than re I have read much by James Lang in the Chronicle of Higher Education and was interested to see that he had a volume out on teaching strategies for classroom professors based on current science of learning. Overall, this small volume on "Small Teaching" succeeds on many levels and would make an excellent jumpstart summer-read for teachers who feel that perhaps some of their courses and teaching have stagnated in recent years. Based on the strategy of "small ball" from baseball where rather than relying on heavy-hitters knocking it out of the park, you focus on strategic incremental base-by-base techniques to drive up the score; Lang's suggestions here won't completely revamp or change your classroom process, rather, they provide several meaningful additions to what you're currently doing that have been shown to be productive in the minds of young adults. Where many volumes such as this give you an endless list of philosophies and methods that couldn't be incorporated into 100 courses let alone one, Lang is very careful to at all times make sure that the strategy discussed is immediately applicable and practical for a wide variety of classroom scenarios. As such, especially for the reflective educator, many of these things are like strategies you have employed before or at the very least thought of. Lang provides you with the method to effectively work them into your current framework/syllabus. The main strategies of retrieving, predicting, interleaving, connecting, practicing, and self-explaining (which many readers in the field are likely already familiar with) are followed by discussions of the most helpful ways to motivate students, manage their intellectual growth, and to expand the expectations you may have for your course(s). I loved this book as it is in line with other texts I have been reading, as well as changes I have made to my classes over the past few years. I got a lot of ideas about teaching and how to change my classroom. I'll be writing a longer review and posting it to my professional portfolio. Definitely a book I would recommend to any educator, not just college profs. 4.5 stars and deserving of a fuller review. Good info, but every chapter seemed to extensively quote from the same couple of sources. I found myself wondering why I just didn't read those books instead. Small Teaching is a great resource for educators. It’s very readable, but, more importantly, it gave me great new ideas that I can immediately use in the classroom and provided scientific research that allowed me to reflect on past successful activities I’ve used. Now I know why those activities worked, which is invaluable. I would recommend this to anyone who is looking to de-center their classes and focus their class time through a variety of learning strategies. Update: My blog post inspired b Small Teaching is a great resource for educators. It’s very readable, but, more importantly, it gave me great new ideas that I can immediately use in the classroom and provided scientific research that allowed me to reflect on past successful activities I’ve used. Now I know why those activities worked, which is invaluable. I would recommend this to anyone who is looking to de-center their classes and focus their class time through a variety of learning strategies. A good text for a book group discussion with college professors - which is why I read it - but not particularly revelatory to someone who focuses on pedagogy. More often than not, my addition to the conversation consisted of something along the lines of "Well, no, this isn't new; we've been addressing engagement/making connections/motivation/activity-based learning in secondary education for years..." with a forced smile on my face. The premise of this book is that the art of teaching is not a linear, set-in-stone activity. Rather, good teaching is about finding a few good ideas and incrementally adding them to one’s teaching plans and activities over time. Over the course of several years, all of these good ideas add up to a solid course. One is never done with incremental change, however. There are constant edits, tweaks, and minor changes as new ideas are incorporated into the course. I think of it like wiki-teaching. An advantage of this book is that is relies on learning theory research. References are made to seminal texts about teaching and learning. The author also incorporates personal teaching experiences and stories. 1. Separate the course into topics (I know organization by learning outcomes is the preferred method, but I feel like this works for me). My course on program assessment and evaluation has about 50 topics. I don’t teach them all every semester, but some are foundational. 2. Each topic gets a physical and electronic folder. In the folder, is a teaching plan, readings for that topic, and an activity. The teaching plan has three columns: 1. Class activities (lecture, group work, etc. ), 2. Readings/videos/other materials and 3. The course learning outcome associated with the topic. 3. There are lots of good books about teaching methods and activities in the classroom. Almost all of my class activities are pulled from those sources. 4. Immediately after class, I go back to my office and tweak the teaching plan based on what did and didn’t work. Doing it right after class helps me remember better. Mostly, I just write notes on the teaching plan and update it in Microsoft Word the next semester I teach. 5. If I see an article or idea over the course of the year, I save it to the electronic folder. This approach allows me to make small adjustments over time. This was A LOT of work in the beginning, but the planning and organization pays off in the long run. I now spend much less time preparing for class the night before and spend more time interacting with students and providing quick feedback to their work. I feel like preparation is an ongoing, all-year activity. With the book content, Lang focuses on small tweaks, activities, or things to keep in mind that will improve students' involvement and learning in your class. They are all good strategies, with the underlying themes of spaced practice, inter-content connections, and engaging students more heavily. Lang also emphasizes the transparency of explaining to students why these things are helpful to students, since they frequently resist or dismiss their first encounters with such activities. I would hyp With the book content, Lang focuses on small tweaks, activities, or things to keep in mind that will improve students' involvement and learning in your class. They are all good strategies, with the underlying themes of spaced practice, inter-content connections, and engaging students more heavily. Lang also emphasizes the transparency of explaining to students why these things are helpful to students, since they frequently resist or dismiss their first encounters with such activities. I would hypothesize that most readers of this book, people who have the impetus to choose to read about teaching strategies in this level of detail, are probably already familiar with a significant portion of the strategies presented. Certainly that was the case for me. One may not be familiar with the studies behind them or the intricacies, but the ideas did not feel fresh to me with the background of teaching-related workshops and reading I had encountered previously. This book is designed to have a redundant layout. Each chapter has an introduction, a theory section (with cited studies), and then sections for the models (how-to) and the principles to focus on when you do it. Lang says from the start that this is designed so that people can dive in quickly based on the second half of each chapter, even if they do not have time to read the theory in the moment. This is part of the "Small Teaching" idea in the first place: small things to implement that make a disproportionately large difference in the students' learning. Unfortunately, this tends to mean that if you read the book straight through, particularly with some prior familiarity with the ideas, you may be falling asleep by the time you get to the re-hash of the principles and conclusion of each chapter. This is not necessarily a complaint-- Lang comments in another of his books On Course that circling back to a concept is a good thing for learning-- but rather it is an observation that is a corollary of the book design. A fascinating book on many small techniques we can implement to tweak our teaching practice and align better with our students. The thoughtful organization of his book was evident even in Part 1, which starts with a discussion that immediately grabbed my attention. I think all teachers, fresh and experienced, can find value in these pages. "When we learn new A fascinating book on many small techniques we can implement to tweak our teaching practice and align better with our students. The thoughtful organization of his book was evident even in Part 1, which starts with a discussion that immediately grabbed my attention. I think all teachers, fresh and experienced, can find value in these pages. "When we learn new facts, we are building up mental structures that enable us to process and organize the next set of new facts more effectively. Knowledge is foundational." "Neutrons that fire together, wire together." "As a teacher in your discipline, your task is to help your students develop a denser, more richly connected network of knowledge and skills in your course content areas." "The more we can help students develop rich networks in our content areas, the more we enable them to build meaning and comprehension of what we are teaching them... For the connections to be meaningful and effective, the students have to form them." For motivation to be high, the learner must find the learning material important (subjective value) and positively doable (expectancies). "I realized at that moment that no matter how great my students are or how well the class is going, I still have to inject some of the energy into the room." Take a few minutes before you head over to class each day to just pause and reconnect with whatever you find most fascinating about that day's material, and let it rise to the surface of your mind -- allowing it to remain there throughout class. Everyone has ability, so ability alone won’t get you anywhere. Successful students put that ability to work. Let's go about this objectively, shall we? The book's objects: to get instructors to recognize the importance and efficacy of "small teaching", to promote the best research currently available in the educational literature to that end, and to provide activities (and their rationales) which will enable teachers to effectively change the culture, processes, and instruction in their classrooms. To me, these are all good goals, and I think Lang met them all. I particularly liked the logical expansio Let's go about this objectively, shall we? The book's objects: to get instructors to recognize the importance and efficacy of "small teaching", to promote the best research currently available in the educational literature to that end, and to provide activities (and their rationales) which will enable teachers to effectively change the culture, processes, and instruction in their classrooms. To me, these are all good goals, and I think Lang met them all. I particularly liked the logical expansion and organization of the book into three dominant sections with three chapters each. All chapters followed the same pattern (anecdote, concept, research basis, models, principles, tips, and conclusion), which made for smooth coasting. I can fault the author for nothing outside his aims, but I can fault him for the execution — in particular, certain aspects of the writing. At times, the introductory anecdotes seemed forced, or too protracted, and that added a certain amount of bloat to the book; it felt longer— heavier — than it needed to. James Lang provides in this small book a number of mostly small (and some not so small) practices that if adopted will transform the experience and heighten the competency of students and faculty members. This is a must read, and do something with, book for college professors of every career phase. If there's a more accessible but also smart writer on teaching, I'd like to know. Lang is a pleasure to read, offering readers the exact right balance of background theory and pragmatic practice. And the premise of the book, that there are small ways that we can make big differences in our teaching, is one that might seem obvious, but really does deserve the book-length attention Lang provides here. This was an incredible book that I would highly recommend to any teacher, not just higher ed teachers. Dr. Lang summarizes cognitive science and a lot of other research on learning and memory in accessible ways, with concrete tips about how to apply them in the classroom. I wish I read this book 15 years ago when I first started teaching. It should be required reading for every higher ed teacher, and I think anyone who teaches anyone anything would find this book very useful. An outstanding book detailing a variety of innovations instructors can make to their daily teaching strategies. The book presents these small teaching options in a way that highlights their theoretical underpinnings and then provides guidelines of how to use them. Incredibly insightful and valuable for any instructors. I know this book is geared toward higher education, but I found it had some very useful tips for middle school teaching as well. It was easy to read and very practical, which is always a bonus in work texts. I was able to implement a few practices right away in my classroom and I could see a positive impact on my students. This is a great book for educators on how to improve your classroom to enhance learning and retention, as well as how to get away from the same old lecture routine. There are tons of good ideas that should only take up 5-10 minutes of class time. A refreshing look at how a classroom can be run! A must read for all teachers! Simply one of the best books on college teaching that I've ever read. This is going to remain on my desk at work so that I'm able to flip through it for ideas each day as I prep for my lessons. Lang offers a wide variety of activities that I've been able to start using immediately in my courses this semester, and I've already seen improvements in my students. I love that this book is structured in a way that you can read it from beginning to end, or read a summary at the end of the chapter. There are so many great ideas for small changes in teaching that can have a large impact on student learning. Teachers from all disciplines and levels will get something from this book. Good stuff. Easy to read, with some very tangible suggestions to make in the classroom. Wish it hadn't ended on the big stuff, which just made me anxious. But I did like the the suggestions for further reading. Excellent overview of simple teaching strategies. This book is very approachable and doesn’t require a full course redesign to implement. I also really like it as a teaching assistant since many of the things can be incorporated into a single lecture. I liked this book and appreciated its practical components. Most teaching books are purely theoretical, and this combined perfectly the theory and models for use. Plus, the theory was written clearly and insightfully. I loved this book. Lang provides excellent activities to try in class to help students learn more effectively. If you teach in higher education and are looking for ways to improve your teaching effectiveness, this is the book. This is one of the best teaching books I have ever read. Lots of good 'small' ideas that can be integrated into the classroom, quickly. No need to wait until the next semester, nor completely overhaul my classes. I highly recommend this book! It revitalized my teaching! I love the mini lesson plans and the writer's tone and approach. The ideas he offers are easy to add into an existing curriculum to spice up our teaching.